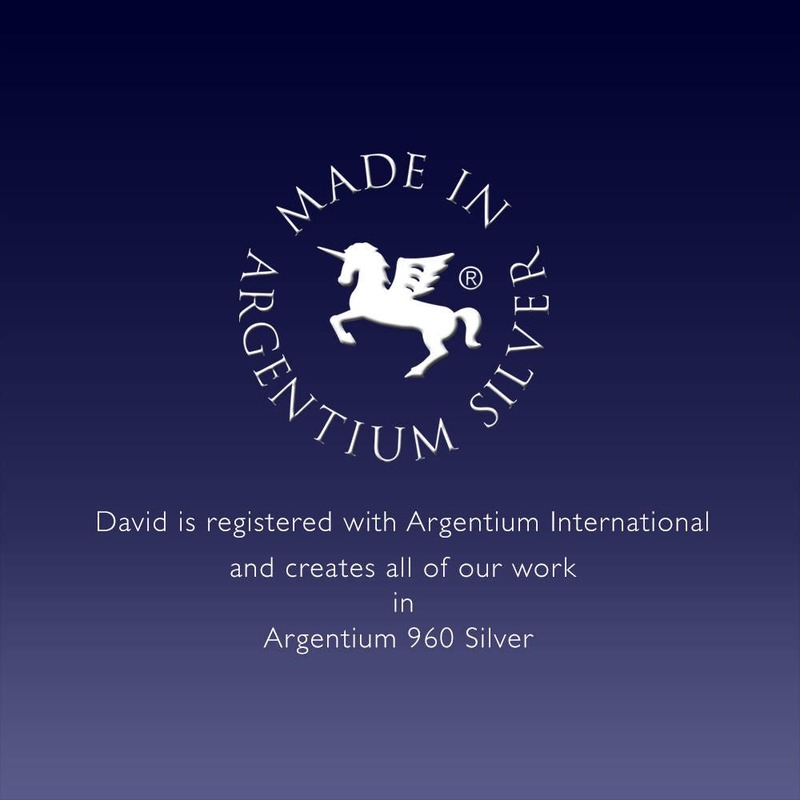 A contemporary, yet timeless design by award winning designer, David Worcester. 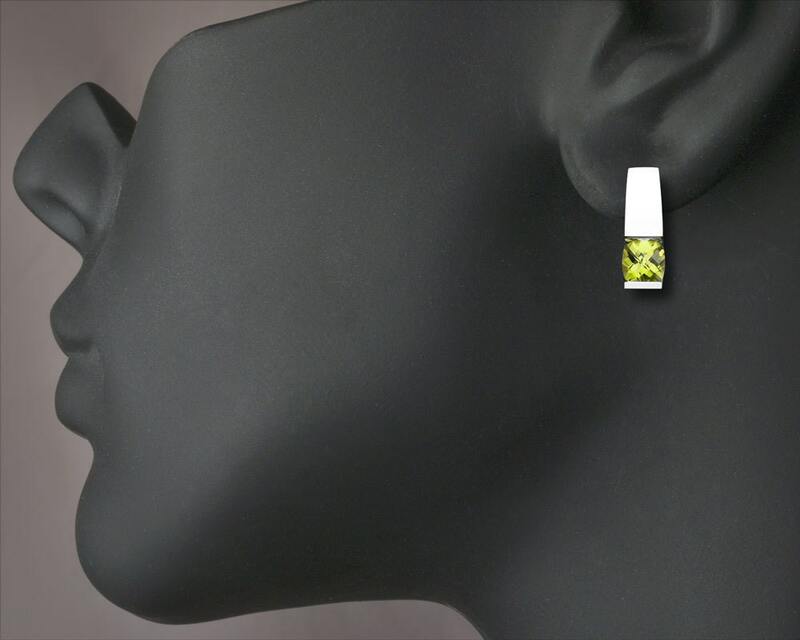 Cast in Argentium 960 premium quality 100% recycled silver, these earrings are specially processed for tension setting. 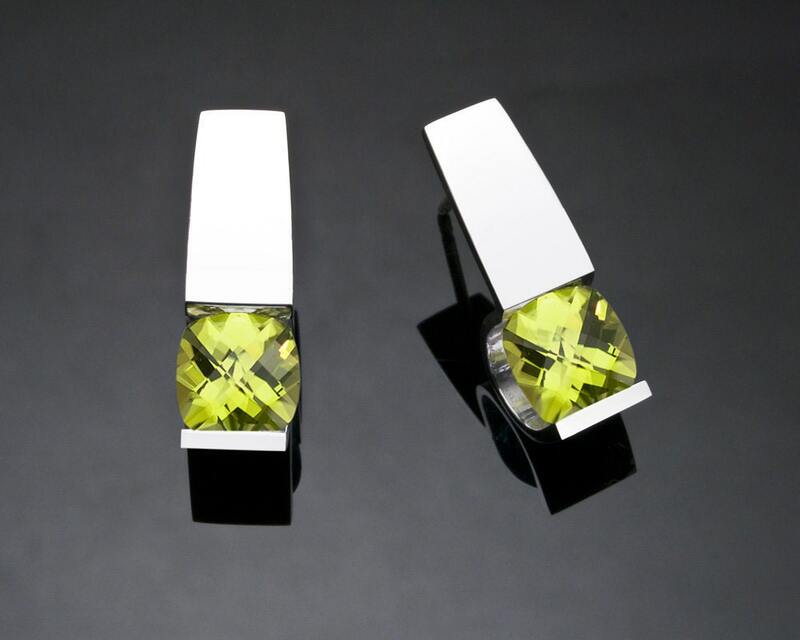 They measure 18mm x 7mm (3/4 x 1/4") inches, and hold six millimeter antique square checkerboard cut Peridot. PLEASE LOOK AT THE MEASUREMENTS CAREFULLY. SOME PHOTOS HAVE BEEN ENLARGED TO SHOW DETAIL, WHILE OTHERS HAVE BEEN MINIMIZED TO FIT THE FRAME. ACTUAL SIZE CANNOT BE DETERMINED FROM THE PHOTOGRAPHS. We do our very best to ship within 48 hours of payment clearing. If it is going be longer than 48 hours, we will let you know. 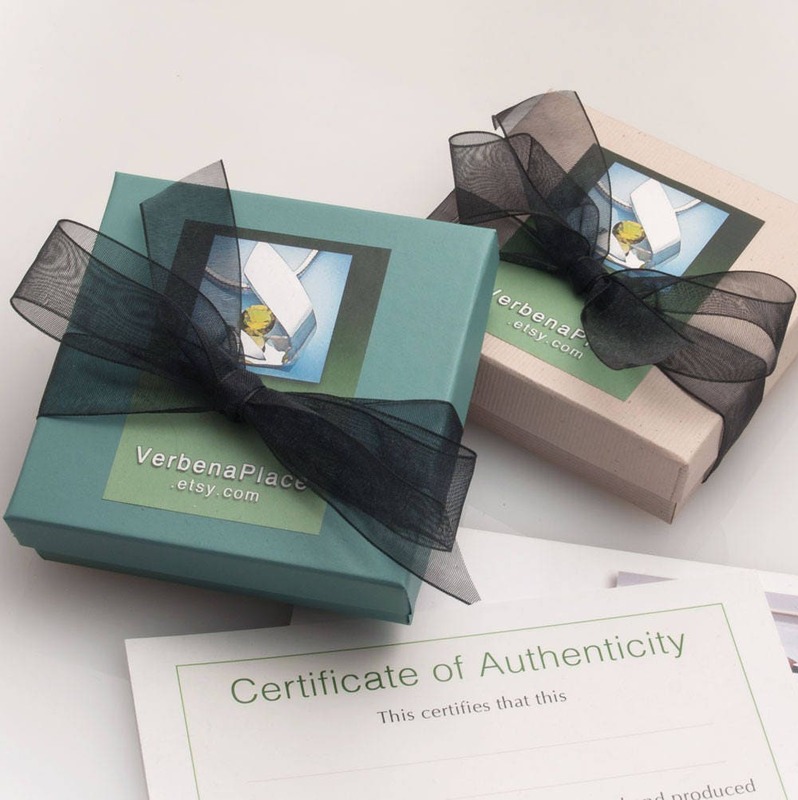 Our items are gift wrapped and shipped via Priority Mail which normally takes 2 to 6 days depending on your location. Please note that the delivery date given by the USPS is an estimate only. We cannot guarantee a delivery date. A certificate of authenticity is enclosed. U.S. shipments only. 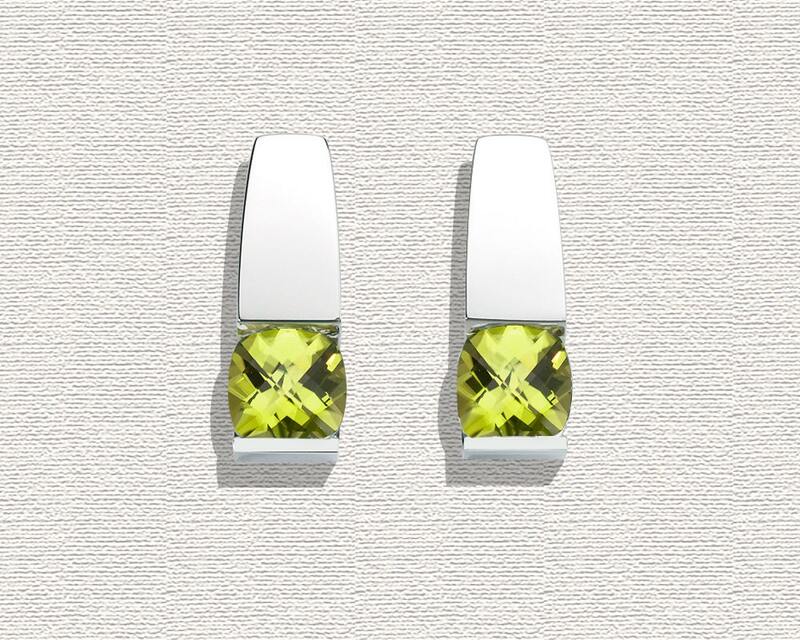 PERIDOT: As the popularity of lime green continues to grow, so does the youthful appeal of this citrus-hued gem. It is August’s birthstone and often used to celebrate the 1st and 16th wedding anniversary. Treatment: Natural. The artist reserves all reproduction rights. No work may be reproduced in any manner whatsoever without expressed, written consent of the artist. We accept Credit Card payments and PayPal only. California residents will be charged sales tax. We do our very best to ship within 24 hours of payment clearing. If it is going be longer than 24 hours, we will let you know. Our items are gift wrapped and shipped via Priority Mail which normally takes 2 to 6 days depending on your location. Please note that the delivery date given by the USPS is an estimate only. We cannot guarantee a delivery date. A certificate of authenticity is enclosed. We try to photograph and describe our pieces as accurately as possible, however, things look different on every computer screen, so if you are at all unsatisfied, we accept returns. Depending on the situation, a 10% restocking fee may be charged. Please contact us within 2 to 3 weeks of receipt of your order if you are unhappy. Because of time restraints and liability issues, we cannot accept any custom work. We hate to disappoint and we really appreciate it when we are asked, but we have learned through experience that we really have to stick to this policy. We hope you will understand. If you have any questions at all about a specific piece, or any questions about our work in general, please contact us. We will be delighted to respond. I have many pieces and love them all!